Insulin Therapy and Alzheimer’s – Could Cyclodextrin Sugar Act on Insulin and Glucose Metabolism? Recently reports in the news shows how insulin therapy may be a treatment for Alzheimer’s. Basically, a low dose of insulin has been found to suppress the expression in the blood of four precursor proteins involved in the pathogenesis of Alzheimer’s disease, according to research by University at Buffalo endocrinologists. Paresh Dandona, MD, PhD, University at Buffalo is a senior author on the study. I am very interested in insulin therapy for Addi and Cassi and I have been looking into this along with a drug called Rosiglitazone. I wonder if I am already doing insulin therapy by giving the twins the sugar compound cyclodextrin into their bodies and brains? I think I’ll email Paresh Dandona about it. Addi and Cassi have major disruption in glucose metabolism in their brains. Dr. Harry Chugani and his team at Children’s Hospital of Michigan discovered this a few years ago in the twins and it is spreading out of control based on our last PET scan. Dr. Chugani and team are publishing a paper about the glucose metabolism PET based brain biomarker in Niemann Pick Type C disease. For over a year, I have been looking into whether or not hydroxy-propyl-beta-cyclodextrin (HPBCD) might have some sort of effect on insulin and glucose metabolism in the body and brain. International Journal of Molecular Sciences (2009): The objective of this study was to elucidate the effects of hydroxylpropyl- B-cyclodextrin (HPBCD) on the in vitro stability of insulin. It was found that HPBCD had positive effects on the stability of insulin in acid and base and under high temperature conditions. Furthermore, use of HPBCD could also increase the stability of disulfide bonds which are important to the conformation of insulin. Through 1H-NMR experiments it was found that the protective effect of HBPCD was due to complexation with insulin. The results suggest that the presence of HPBCD could improve the stability of insulin in different environments. Abulrob et.al. (J Neurochem. 2005 Mar;92(6):1477-86) demonstrated the neuroprotective activity of some cyclodextrin derivatives against oxygen-glucose deprivation (OGD), N-methyl-D-aspartic acid (NMDA) and glutamate in cortical neuronal cultures. Although all Cyclodextrin complexed with NMDA or glutamate, only beta-, methylated beta-and sulfated beta-CDs displayed neuroprotective activity and lowered cellular cholesterol. I have been asking our researchers to see if they can conduct microPET on the Niemann Pick Type C mice to see if they can find a hypometabolism issue in the brains of the mice like they find in my identical twins. If found, researchers could give the NPC mice the cyclodextrin and test as to whether or not it has an effect on insulin and glucose metabolism in the brain. If so, this could be a very important finding that could bolster the University at Buffalo’s work. Both Niemann Pick Type C and Ataxia – telangiectasia there is massive loss of Purkinje cells in the brain — loss of Purkinje cells in one of the first signs in NPC disease. Why the massive loss of Purkinje neurons in Niemann Pick Type C and Ataxia – telangiectasia? What is the connection point causing loss of Purkinje neurons? I think it might be glucose metabolism or insulin utilization. Given the glucose metabolism issue we have found in Addi and Cassi’s brains and the ataxia which is one of the first symptoms of the disease, maybe glucose metabolism and insulin issues are a core issue in NPC? I read that the cerebellum is largely fueled by glucose and the cerebellum is where Purkinje neurons are located! Steve Walkley’s work shows that cyclodextrin rescues Purkinje neurons in the NPC mouse model – could it be acting on glucose metabolism or insulin? Could cyclodextrin rescue Purkinje cells in Ataxia – telangiectasia? Monday, Feb. 28, is Rare Disease Day 2011. Here is a great story from the Orange County Register, which is helping to raise awareness for rare diseases and our efforts to spread awareness through our blue denim jeans ribbon and “Wear That You Care” campaign. Local advocates looking to kick-start research to help patients with rare diseases got a boost Wednesday afternoon when an official with the National Institutes of Health stopped by to talk. Dr. Stephen Groft, director of the NIH’s Office of Rare Diseases Research, visited with a Dana Point nonprofit group aimed at building a community for people with rare diseases. A rare disease is defined as one that affects fewer than 200,000 Americans. Groft informally talked with people who went to meet him at an office in La Plaza shopping center off Pacific Coast Highway that houses the RARE Project (Rare Disease Advocacy Research Education). 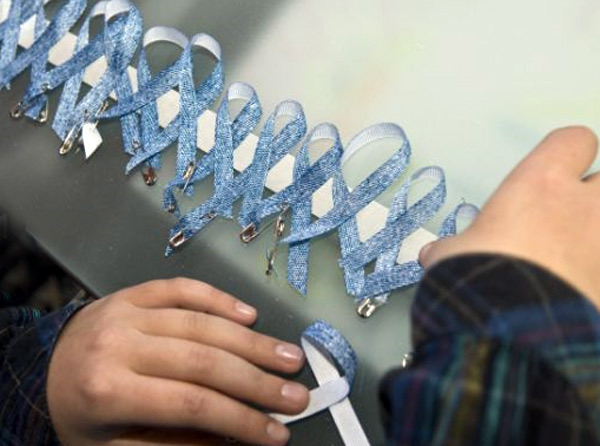 As he did, children created blue denim ribbons similar to the red ones for AIDS awareness or the pink ones for breast-cancer awareness. “It’s symbolic that the NIH is coming to speak to this organization. It shows they recognize the power it has,” said Beth Anne Baber, a San Diego cancer researcher and mother of a child with a rare pediatric cancer. Baber spent hours talking to Groft about what can be done to make advances in rare-disease research. Monday is Rare Disease Day, and the RARE Project plans to present a 3-foot denim ribbon to NIH Director Francis Collins at a ceremony at NIH headquarters outside Washington, D.C. The NIH Office of Rare Diseases Research, which stimulates research and acts as an information center, has been around since 1993, but rare-disease research has taken a step into a faster lane in the past five years. Groft attributes that to a greater sense of collaboration among patients groups, researchers, pharmaceutical companies and government. In 2009, NIH dedicated $24 million to pave the way for new treatments for rare diseases. Soon after, the U.S. Food and Drug Administration began providing more grants to encourage researchers to produce more rare-disease treatments. But Groft’s office is one of many NIH branches. Of the NIH’s $31 billion budget, the Office of Rare Diseases Research gets about $18 million a year. Patients advocates say more money is needed for research, but it can be tough to persuade the government or private pharmaceutical companies to spend money on products when a small number of people have a particular disease. It costs about a billion dollars for a company to develop a new drug. Groft said he often plays the role of myth-breaker when he talks to the pharmaceutical and medical communities. Many think there is little information about rare diseases and that research is scarce. Groft said that’s not true. About 1,100 advocacy groups worldwide, including the one in Dana Point, are working to increase awareness of diseases most people have either never heard of or wouldn’t think of as rare. Childhood cancers, for example, are considered rare. So, too, are developmental disorders with names such as campomelic dysplasia and pachygyria. The RARE Project began in 2008 as an umbrella organization to connect multiple rare-disease groups. Though each disease affects a small number of people, almost 7,000 rare diseases affect 30 million people in the United States, 75 percent of them children, advocacy groups say. Most rare diseases don’t have a drug designed to treat them. Nicole Boice began the RARE Project after a friend had a child with a rare disease. She saw how isolated the family felt and how worried they were. After some research, she learned how many people have rare diseases. Advocacy groups for patients of rare diseases often focus on a specific disease, making their numbers small. If the groups had an organization to connect them, Boice thought, they would have more power in numbers. Numbers are often what it takes to get research done. Baber, who started an advocacy group for childhood cancer research called the Nicholas Conor Institute (after her 7-year-old son), joined forces with Boice. They figured they could play a role in showing scientists a large number of patients willing to be tested. “We have to make it easy. That’s how this community will win,” Boice said. This year her group launched the Global Genes Project, a campaign to increase awareness of children’s rare diseases. The group is encouraging supporters to wear denim ribbons or jeans on Rare Disease Day. The group plans to start its first round of fundraising for research by this summer. The dream is to get as big as the Susan G. Komen for the Cure breast-cancer foundation. We started Christmas Eve day in the San Francisco Bay Area at Children’s Hospital Oakland where Dr. Caroline Hastings gave Addi and Cassi their sixth injections of cyclodextrin into their central nervous systems. By 1 pm, Addi and Cassi were feeling a lot better and we raced home on Highway 80 up over Donner Summit, arriving home just in time for Santa’s visit at 7pm. 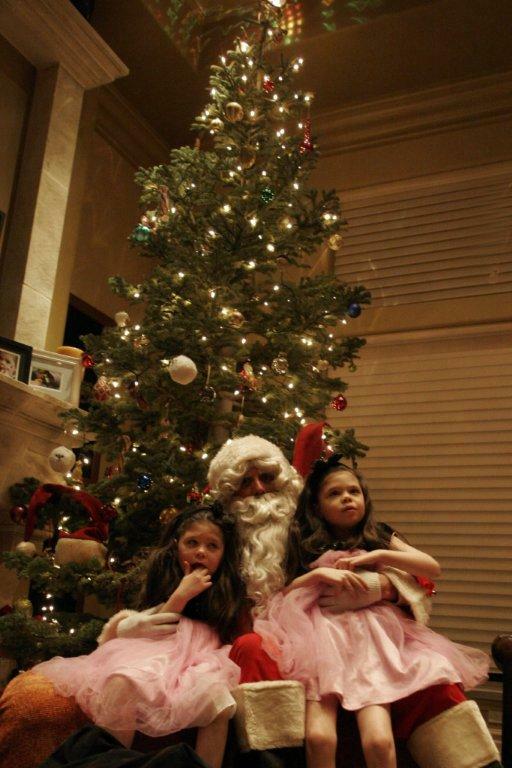 Here are some of our pictures from Christmas 2010. We are so blessed to have our little angels in our life. We hope you all have a very nice Christmas and Happy New Year.